Google is about to roll out an updated version of the company's captcha protection that tries to determine whether a connection was made by a user or Mr. Roboto. Captchas are designed to separate between humans and bots. While sites may want to allow entrance to all human visitors, they may not be as forthcoming when it comes to bots. Too many bot connections may impact a server's responsiveness negatively. Additionally, bots are often used for nefarious activities such as bulk registration of accounts, spam, scraping, and other activities with negative connotations. Google's recaptcha captcha system is widely used on the Internet. The system is already one step ahead of many other solutions, as you may only have to click the "I'm not a robot" box to pass the captcha and enter the site. You may get to solve a captcha or multiple ones if the algorithm used determines that you may not be human however. This can be a really frustrating experience, especially if you use Tor or are connected to a virtual private network (vpn). The reason for this is that these services are not only used by regular users but also by spammers who get the IP addresses flagged. While captchas are solvable most of the time, you may run into situations where the captcha is broken. The new invisible captcha that Google showcases here goes a step further. Instead of having to click a box, users may not have to do a thing to gain entrance to a site that uses the new invisible recaptcha technology. In the best case, access is granted without users doing anything. The algorithm determines that the user is human and grants access directly. The system falls back to captcha solving if the algorithm determines that a user may not be human. 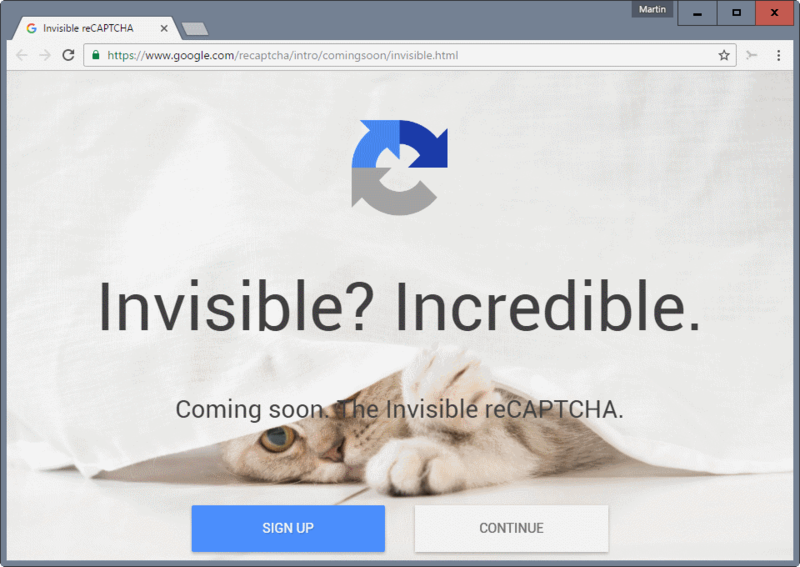 Webmasters who use recaptcha on their properties may sign up already for invisible captcha to deploy it before it becomes available to the public. All they need to do in best case is to replace the old code with the new on their web properties to make use of the new system. Improvements to the detection of humans are always welcome. This one means that you may not even see a captcha if the algorithm determined that you are human in the background. That's a step in the right direction. Now You: What's your captcha experience so far? Google is about to roll out an updated version of the company's captcha protection that improves the verification process for human visitors. This will actually teach people to keep Cookies or be otherwise track-able by Google for exploitation of their data. If you take measure against tracking, you will be punished. Nice idea, Google. You say this like tracking is a good thing. I pretty sure he’s being sarcastic. Word captchas were fun at the beginning, especially the distorted ones which couldn’t be read by humans. Now I’ve seen some 3 level captchas with multiple images. I generally leave those sites forever. edit: Don’t know if I’ve ‘seen’ an invisible captcha yet, so I can’t say much about these. Thanks for the Mr. Roboto link. I’ve seen/used/attempted a great many irritating captchas. Sometimes they can’t be read, and I’ve had to ask for another. Sometimes I’ve had to ask for a verbal captcha. Then there are those picture versions. Grrr. Does part of a sign count or only a whole sign? Does a shoetree count as a tree or does only a leaf-bearing plant with a trunk qualify? Speaking of trunks . . .
As for invisible captchas, how does one know if one has been encountered if one can’t see it or hear it? As I systematically boycott the sites using :-Î’s captchas, you can’t punish me Google. A devil’s company transforming humans in blind robots wanting to know if they are still human. Frightening. It’s happen to me too few times a week but it’s because I ping Google for my gmail every few minutes so if our request to google are to numerous in a short time frame we are suspected to be bots. On a wireless what can happen is that from the same IP address to many request are executed at the same time and google suspect a bot… also add the request in the background from apps to google in the mix and it can do lot of suspect request in a short time frame. Helpful, but worrying. If Google can understand silently I’m not a robot, how does it know ? And what else does it know ? Picture captchas are unpleasant, but letter captchas are the worst. Many times, they just can’t be read. Also, if the new contraption does not work on Tor and VPNs, it’s of little use. Your browser has a unique fingerprint, there is little you can do about it. The majority of pages on the web send requests to Google when you visit them and include this fingerprint in the request (Google Ads, Google Analytics, Google fonts, and so on). It is fair to assume that Google can follow most of your steps on the Internet. It probably does not take much artificial intelligence to distinguish a human from a bot when you have all that data. From time to time you will log into a site that has your real identity (thing Ebay, Amazon). These pages also use Google components mentioned above. Now Google not only knows what you are but who you are; and what you do, think, and will be doing in the future. I wish they would just remember the IP for some days/hours or save a cookie. It’s ridiculous that I have to enter several captchas despite having solved several already. AI will have performed a giant’s leap the day it will be able to trick such Google’s invisible captchas. Meanwhile I’ll try to imitate a robot in the perspective of cyber brotherhood. More seriously, all depends how these invisible captchas are, will be deployed. Do they send to a server the user’s data, IP, history and so on? Are such captchas integrated in the Wide Wild Web as an extra tracking tool, or are they plain smart coding acting locally and un-linked to tracking? As often the best intention can use the worst tools and worse : get the user to wonder if the real aim is not the tool… or the intention may be and prove to be a simple contribution, free of sneaky hidden aims, to a better Web. I have no idea. Whatever, here with uBlockO I’ll keep on allowing (scripts, fonts, media, apis, external calls …) on a per-site basis with a “shut-up” as the default configuration, and that will include captchas, be they hidden I guess, I hope. Not enough information at this time to have a neat, precise idea. Somehow I rarely encounter a captcha, once a week at most, even though I do a lot of browsing and often use a VPN for privacy. I rarely come across a captcha where only clicking the “I’m not a robot” box is enough, I almost always have to solve one. Same goes for other captcha systems. I don’t know why because I’m not behind a VPN and I don’t have tight privacy settings either. I’m using Linux, however, so maybe they identify that as ‘bot-like’ behavior. I support the idea of captchas but it’s a big hassle for me personally. Those recaptcha photos aren’t always clear and esp. other captcha systems have captchas that are almost unreadable for me so it’s a hit or miss for me. My parents have the same problem. That’s why I hate captchas in their current implementation, they make parts of the internet difficult to use for me (and my parents). Q : ‘A’ is the father of ‘B’. But ‘B’ is not the son of ‘A’. How’s that possible? A : ‘B’ is the daughter of ‘A’. Q : An electric train is moving north at 100mph and a wind is blowing to the west at 10mph. Which way does the smoke blow? A : There is no smoke with an electric train. Q : How can a man go eight days without sleep? A : By sleeping during the night time. Makes you think moreover (well, you know, some think faster than others), blends efficiency with fun. … or if the algorithm determines that the user isn’t using Chrome. Don’t underestimate the level of discrimination going on with Google’s reCaptcha this day already. For example, Pale Moon users are already tortured with “try again” on proper solutions and endless click stream challenges on sites. That on sites that should support the “noclick” captchas (JS computation based). I only expect this to get worse. Quite underhanded, if you ask me. Well, recaptcha always thinks I’m a robot and I have to solve captchas. So, what will change? Nothing. I still have to solve captchas, congrats… Google is more and more disgusting. I wouldn’t say disgusting. Because Google aims to provide a better Web and consequently is everywhere (or is it the other way around?) it has responsibilities. Like the President of the U.S.A. (by analogy with President of the Web) it has its enemies but has also to deal with the enemies of its friends (not sure the comparison will remain valid with the new US presidency) and therefor, given this genuine vocation, that to point evil and to glorify the good, the company inevitably faces the terrible dilemma which is to choose between doing nothing and struggling for the safety of each and one of us should it cost our privacy. This said, at least Google delivers excellency, which helps to swallow the pill. Comparing with a company which is as indiscreet as Google and which moreover proposes a non baked browser within a non baked OS. Dig! Getting this whenever I need to solve a captcha. No VPN is used. Checkd/tried everything possible. No idea about why it happened to me.